Adrian is four years old, loves music, cheeseburgers, computer games and being with his dad. At first glance, everything about Adrian seems to be like all children his age. But Adrian is different he is autistic. Don’t Give Up takes its audience on a powerful and inspiring journey with an autistic boy and his devoted father as they try to break down the barriers of communication on the road to better understanding. Dealing with a multitude of sacrifices, endless tantrums, and sometimes hysterical bouts of crying, his parents’ dedication to him never wanes. Twice a week his father Perri drives 250 kilometres from their small community to the big city where Adrian attends the Socialization, Communication and Education Problems Centre. Participating in a revolutionary remedial program of speech therapy, Adrian’s progress is slow at first. For months, Perri must entrust his son with strangers, six hours a day, even when Adrian is screaming “Daddy” through streaming tears. But Perri’s optimism for his son’s future remains unwavering as he and Adrian share their personal struggle of joy, frustration, and ultimately, strength of the human spirit. 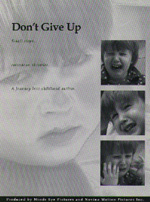 A production of Minds Eye Entertainment and Novina Motion Pictures Inc., Don’t Give Up was produced and directed by Jan Zarzycki. Rob King is writer, producer and narrator, Lisa Donahue is producer and Kevin DeWalt is Executive Producer.